Your vehicle’s brakes are its most important safety feature. To protect yourself and your passengers you should pay close attention to the quality of your brakes. Being proactive goes a long way when providing quality auto service, and the vehicle’s braking system is no exception. If you are unsure if you need brake repair, feel free to bring your vehicle by our shop and one of our ASE Certified Brake Specialist will help you determine if you have a problem with your brakes. You can also look out for and pay attention to the early warning signs attributed to brake failure. The early warning signs are usually audible. There might be an abnormal, annoying, or high-pitched screeching noise heard when you apply your brakes. Your braking system is designed to make a high-pitched squealing noise when your brake pads have worn down too low. This is an indication that you need to visit C & C Auto Service in Raleigh, NC. Drivers sometimes miss this early warning sign because they cannot hear it over the radio, or because the ac or heating unit is on. Failing to catch these signals and giving your brakes the proper attention will inevitably lead to costly repairs. Other signs that you may be due for brake repair are a vibration in the steering wheel or brake pedal. IF you are experiencing any of these issues, bring your car to a reputable mechanic. When you miss the early warning signs for brake repair, you run the risk of doing further damage to the braking system’s individual parts. If the squealing noise is not addressed early enough, you will eventually wear through the brake pad to the rotor. This metal-on-metal sound will be an unmistakable grinding noise. This may cause your rotor to become damaged beyond repair. You should cease to drive your vehicle in this condition. Bring your vehicle to C & C Auto Service immediately. You can drive to our facility if possible, but towing may be necessary. Our brake repair experts would like to get a look at the condition of your brakes before we ever need to replace braking system components. Give us a call today to get your brakes serviced correctly the first time. Our technicians save you time and money by using state-of-the-art equipment and performing effective brake maintenance service. If you have noticed an abnormal sound, smell, or performance from your brakes, do not wait too long to get it checked out. We have a long history of excellent customer satisfaction. 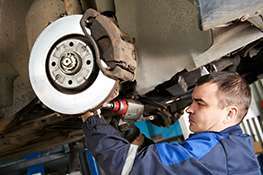 Call us today at 919-859-0207 so we can schedule your vehicle for a brake repair appointment. You may schedule your appointment online as well. Free Wi-Fi and coffee while you wait and local shuttle service is available if needed. We look forward to serving you!